Last weekend, James Bond star Daniel Craig paid a visit to British troops stationed at Camp Bastion in Afghanistan, the latest example of leading lights from the cultural world paying homage to “our brave boys” as they ride roughshod over the dignity of the people of Afghanistan, argues Peter Warren. 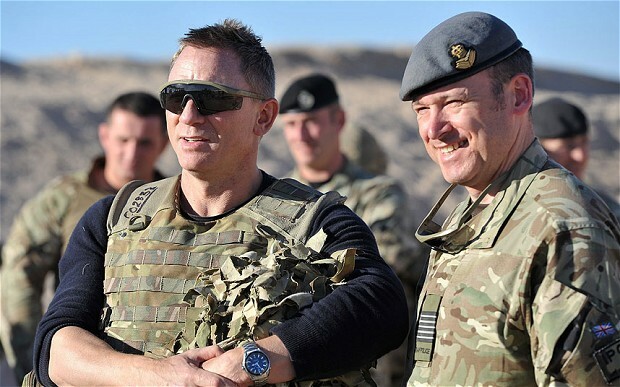 Star of the latest James Bond security state propaganda spectacular Skyfall, Daniel Craig, stopped in on British troops stationed at Camp Bastion in Afghanistan last weekend, in what The Guardian described as a “morale-boosting visit”. Whether that was intended to mean morale-boosting for the Afghan population which continues to endure a foreign military occupation now running into in its eleventh year, or for the squaddies who are tasked with carrying that occupation out was not explicitly clarified by the paper, although the article’s gushing tone left little space for ambiguity. Craig arrived in time to introduce a showing of his new film, which bears all the hallmarks of the James Bond series in the sense that it proclaims the right of the British state to kill whoever it deems necessary, when and where it likes, with no judicial oversight (Dershowitz would approve) and without the need for any justification – as the Guardian’s caption put it, “for Queen and country”. The British troops stationed at Camp Bastion, of course, do not need reminding of this inalienable right – their current deployment overseas is but one example of its application – and James Bond and other such cinematic brainwashing masterpieces play a pivotal role in convincing the British public that the security services exist fundamentally for “our” protection; in order to safeguard “our” freedoms. Daniel Craig’s visit to a military base on occupied land perfectly complements the underlying message which James Bond films exist to purvey – might is right, and the British state has conferred upon itself the option to interfere in the affairs of other nations as it sees fit. Craig’s stopover is just one recent example of leading lights from the cultural world paying homage to “our brave boys” as they ride roughshod over the dignity of the people of Afghanistan. BBC Radio 1 DJ Tim Westwood stopped in at Camp Bastion last year to broadcast live from the base, while Sky Sports dutifully sent reporter Geoff Shreeves to the same outpost with the Premier League trophy under his arm at the close of 2010, once again in order to “boost morale”, as the Ministry of Defence described it. How sweet. Such public relations ventures contribute to legitimising the war in the face of mounting disillusion in Britain over both its purpose and duration. Unjustifiable from the outset and initiated under an entirely false pretext, the conflict has dragged for over a decade at the cost of tens of thousands of innocent Afghan lives, while the British soldiers who so courageously make the continuing bloodletting possible are heralded as heroes from afar. While pro-military propaganda is the principal objective of such high profile visits to British bases, it should be noted that the James Bond series provides a similar glossy coating to the nefarious activities of Her Majesty’s Services. In the films, Bond works for the same agency that former MI5 agents Annie Machon and David Shayler fingered for its part in an ultimately unsuccessful plot to pay an ‘al-Qaeda cell’ in Libya to assassinate that country’s then-president, Muammar Gaddafi. Shayler was eventually jailed for his part in exposing the conspiracy, after a court case in which he was denied the right to present a thorough case to the jury. In the early 1950’s, MI6 colluded with the CIA to carry out a vicious campaign of false flag terrorism and other subterfuge, overthrowing the democratically elected government of Iran under President Mohammed Mosaddegh. He had pledged, with the backing of the country’s parliament, to nationalise the Iranian holdings of the Anglo-Iranian Oil Company, known nowadays as BP. Mosaddegh’s ousting paved the way for the Western-backed Shah’s reign of terror, which lasted for more than 25 years. Following the conclusion of the Second World War in Germany, MI6, through its operative Adolf von Thadden, helped found and run what would go on to become the most successful neo-Nazi political party anywhere in Europe. The National Democratic Party (NPD) was set up by British intelligence, and its operations were coordinated in conjunction with key players from both British intelligence and the Verfassungsschutz, West Germany’s security services. The NPD is still alive and kicking today, and its activities have been decisive over the years in allowing the German government to pass some of the tightest restrictions on freedom of speech anywhere in the industrialised world. Closer to home, MI6’s domestic sister agency MI5 orchestrated a campaign of terror in Northern Ireland over a period of several decades, embedding its agents in the IRA in order to coordinate a long list of lethal terrorist attacks which were blamed on Irish republican groups. In a recorded telephone conversation earlier this year, General Sir John Wilsey, the commander of the British Army’s Land Forces admitted that the head of the IRA’s Internal Security Unit – known colloquially as the ‘Nutting Squad’ and tasked with rooting out British spies and double agents from within the IRA’s ranks – a man named Freddie Scappaticci, was, in fact, a British agent for the Army’s Force Research Unit (FRU). As Wilsey put it, “The FRU worked for MI5 and the RUC [the Royal Ulster Constabulary, now the Police Service of Northern Ireland] and all the [intelligence] went to them.” Scappaticci was famed for his ruthlessness – most of the men he investigated were eventually killed – and he personally carried out dozens of murders, in many cases executing genuine IRA members, over a period of several years. This is shocking enough in isolation, although the full extent of the role played by the British Security Services in fermenting the “Troubles” has yet to be fully revealed. Given their documented complicity in a litany of activities as deplorable as the aforementioned -the above list is by no means exhaustive – it is remarkable that MIs 5 and 6 continue to enjoy such a position of respectability in the eyes of many. The James Bond series is an essential propaganda vehicle which has delivered the kind of pro-establishment messages that continue to enshrine this position, both overtly and more subtly, over the last five decades. By no means unique in this, James Bond certainly stands as one of the most pernicious and effective examples of its type. Daniel Craig’s brief jaunt to Afghanistan is revealing in more ways than one. Peter Warren is a writer and activist based in the UK.